From left to right: Ann S. Moore, chairman and CEO, Time, Inc.; Kelly Thomas, co-president, Stern Women in Business; Nagina Sethi, and Kathryn Swintek. In December, the Committee of 200 (C200), the organization of leading women business owners and corporate decision-makers, and French bank BNP Paribas presented a $25,000 Scholar Award to Stern MBA student Nagina Sethi. The C200/BNP Paribas Scholar Award is given to a first-year, woman MBA student whose pre-business school track record and first-year transcript indicate that she will be an outstanding business leader. The award was presented by C200 member Kathryn Swintek (MBA '79), head of US Leveraged Finance Group, BNP Paribas, at The C200 Fall MBA Outreach Seminar for women MBA students hosted by student club Stern Women in Business (SWIB) at NYU Stern. The seminar, “Managing Your Career, Your Brand, Your Life in a Changing World,” included Stern women MBA students and more than 40 C200 members who are leaders in a variety of industries, from banking and insurance to professional services, technology, and manufacturing. The scholarship award includes a 10-week paid internship at a C200 member's company and weekly one-on-one mentoring sessions with the C200 member during the internship. In addition, C200 has committed to Stern women MBA students 30 other internship opportunities at C200 member companies, during which preeminent business women will mentor selected students. Nagina Sethi has an undergraduate degree in molecular and cell biology from the University of California at Berkeley. Before coming to NYU Stern, she worked as a consultant for Kaiser Permanente where she helped start a nonprofit women's birthing center for underserved families in Oakland. C200 holds MBA Outreach Seminars twice a year – fall and spring – at selected business schools, including Babson, Carlson School at The University of Minnesota, Carnegie Mellon, Columbia, Duke, Emory, Harvard, Kellogg, Santa Clara University, Thunderbird, University of Michigan, UNC-Chapel Hill, Vanderbilt, and Wharton. C200 has reached more than 11,000 women via the Outreach Seminars and has awarded more than $500,000 in scholarships in conjunction with the program. In its ongoing efforts to provide students the opportunity to leverage New York City as a learning experience, NYU Stern offers a unique case study. For the fifth year last fall, students in the required MBA core course, Managing Organizations taught by Professor Richard Freedman, studied the organizational challenges faced by the Metropolitan Opera, the world's largest opera company. In September, they visited Lincoln Center for a backstage tour and an in-depth look at the inner workings of one of New York's leading cultural institutions. At the Met Opera, the students visited the costume, electric, carpentry, and props departments, and learned how each unit contributes to the organization. Students were also given the rare opportunity to observe a dress rehearsal of the season's opening night gala, which included Act I from Le Nozze di Figaro and Act III from Samson et Dalila. Following the tour and dress rehearsal, students attended an NYU Stern marketing panel moderated by Deputy Dean Russell Winer and featuring Stern Professors John Czepiel, Peter Golder, Eric Greenleaf, and Joel Steckel. The panel addressed the issue of declining opera attendance among young adults and requested student recommendations for increasing attendance. One student suggested bringing in musical artists that are popular among today's youth, and mentioned the recent example of Metallica playing with the San Francisco Symphony Orchestra. After the panel, students participated in a question and answer session with the Met Opera's general manager, Joseph Volpe. Volpe, who began his 40-year career at the Met Opera as an apprentice in the carpentry department, shared his perspectives on arts management and responded to student suggestions about how to improve the organization. 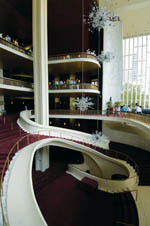 Under Volpe's direction, the Met Opera has experienced a period of unprecedented success, culminating in a record 29 operas produced in the 2005-2006 season. “Only at Stern and only in New York could I have had the experience of seeing and listening to Plácido Domingo, a legend among opera singers, and having a discussion with the general manager of one of the best opera houses in the world,” said Álvaro Cañil, a first-year MBA student and opera aficionado. The Met Opera visit confirmed the connection between business and the arts, and encouraged Cañil to announce that he was working on starting an opera club at Stern. “Getting such an in-depth view of the opera was a great experience, and hopefully it has planted the seed of opera in many other students,” he said. Each fall marks not only the start of the semester, but also the kick-off to the college tour season, during which eager parents and their teenagers check out campuses and curricula, determining which school will be the perfect fit. During this past season, NYU Stern School of Business, in partnership with the Wharton School of the University of Pennsylvania, took advantage of this captive audience to educate them about what it means to study business at the undergraduate level and how doing so broadens career opportunities. Through their joint educational initiative, “Discover Business Now,” these two leading undergraduate colleges stressed to high school juniors and seniors the value of an undergraduate business program and why it should be a consideration during the college search. The Schools introduced their initiative through two events, one in New Jersey and one, for women exclusively, in Philadelphia. The more than 200 students and parents who attended had the opportunity to hear from and speak with the deans, alumni, and current students from Stern and Wharton. Visit www.discoverbusinessnow.org for a “virtual” undergraduate business experience. NYU Stern's Undergraduate College is one of the most prestigious, popular, and competitive programs among college aspirants. Applications are up 11 percent for the coming academic year, and average SAT scores for the current freshmen class reached 1422, the highest in the program's history. In addition to offering a liberal arts-infused business curriculum, Stern's Undergraduate College uniquely leverages New York City as part of its educational experience. Erik Kimel (far right) and his Peer2Peer Tutors team. In 2004, while in a calculus class during his senior year of high school, NYU Stern sophomore Erik Kimel (BS '08) took notice of both his bright classmates and his peers who could use their help. And he came upon the idea of creating a tutoring service by and for students. He placed an ad in his local Montgomery County, Maryland, newspaper, offering himself as a tutor. Within six months, Kimel had created a network of 25 tutors and formed his company Peer2Peer Tutors. Peer2Peer is built on the premise that students learn best from other students who have taken the classes, know the teachers, and can relate to clients. This concept hit home with both parents and students, and by January 2006, the company had served more than 100 clients in elementary, junior, and high school, employed more than 80 student tutors, and provided more than 2,500 tutoring sessions in subjects ranging from algebra to Chinese. Revenues had grown an astounding 90 percent by the company's second year. Managing the Maryland-based company from his dorm room in New York, 19-year-old Kimel travels to his home state once a month, and works full-time over his holiday breaks. This year he hired Management Operational Mentors (M.O.M.s) to control everyday operations, such as scheduling tutoring sessions and networking with local schools. The first M.O.M, Ann Connelly, joined the company after her two children were successfully tutored by Peer2Peer. Eager to expand the company into New York City and beyond, Kimel decided to test his business plan by entering the Stern Berkley Center for Entrepreneurial Studies' Maximum Exposure Business Plan Competition, which annually awards significant funding to the team with an innovative and developing concept. The only Stern undergraduate student to have made it past the first round, Kimel placed third in the finals of the 2004-2005 competition. Losing the competition inspired Kimel to fine tune his business strategy, which resulted in the introduction of M.O.M.s and a badly needed website. At the 2005 NYU Entrepreneurship Conference, he was introduced to Reflexions Data, an interactive design company, which helped him build a website that allows the company to attract new tutors, sell tutoring sessions, and track appointments. “I love my work, and for as long as I can do it, I will,” he said, adding that he is grateful to Stern Professor Kenneth Preston for mentoring him and that he credits his Stern education with helping him to grow his business properly. If Peer2Peer continues to mature as Kimel has, he just may have the lasting business he envisions.